Home People Breathe Easy, Live Well! Ceiling Fans are the answer! 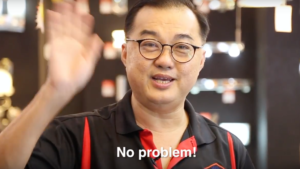 This is the second time our home electrics expert Mr Lim has featured on our People minutes. But instead of lights he is giving us some tips on ceiling fans! Especially in the tropical climate of Singapore these suggestions come extremely useful! Fans are essential to Singapore life! Itchy noses, trouble breathing? 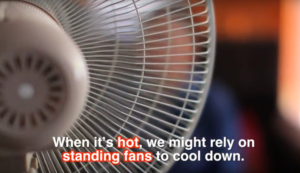 Your fan might be the problem! Many of us may rely on our standing fans to cool ourselves down on a hot summer day. 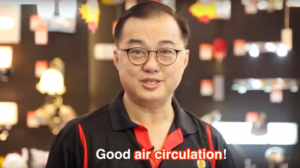 But if you have allergies, Mr Lim has a better alternative! Ceiling fans! Ceilings Fan’s provide more consistent and steady air circulation which can filter out allergens, while Standing fans just provide harsh and irregular bursts of cooling wind. It is this persistent change in wind strength that may trigger your sensitive nose. In contrast, ceiling fans provide a gentler, and a more even circulation which allows you to breathe more easily. Thanks for the recommendation Mr Lim! Like this story? Check out more awesome stories in People Minute! Previous articleThe SECRET to Tasty Claypot Rice!